Let’s get right back into the Disney World goodness! (If you missed part 1, click here.) 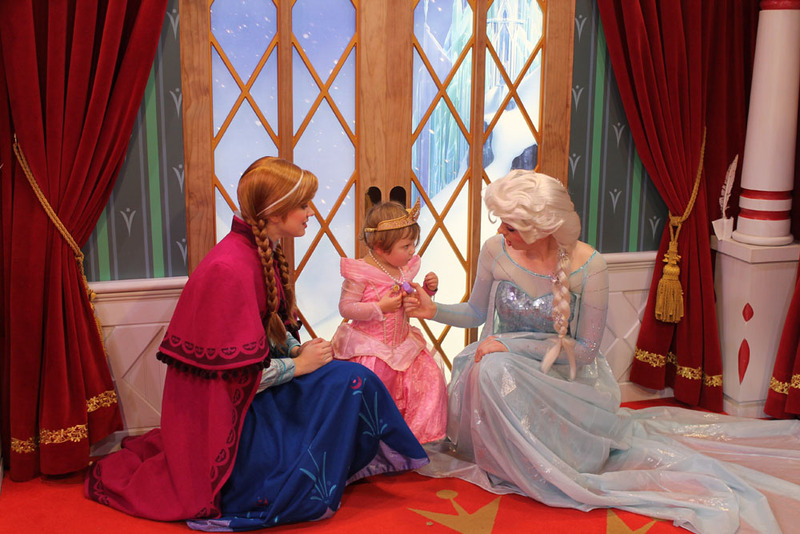 On February 5th we spent three hours waiting in line at Epcot to meet Anna and Elsa from Frozen. In that time, my dad and I ran over to the cafe in Paris called Les Halles Boulangerie & Pâtisserie and had sandwiches which were awesome. I was too perturbed from the line to snap a picture, but I did last time. Still, it was worth every minute because she still talks about meeting her favorite charactera and having them sign her Frozen book which we read at night sometimes. That night we headed back to The Wave…Of American Flavors inside the Contemporary. Wave has easily become our favorite sit down restaurant at Walt Disney World thanks to its nice, quiet dining room and wonderful selection of entrees. 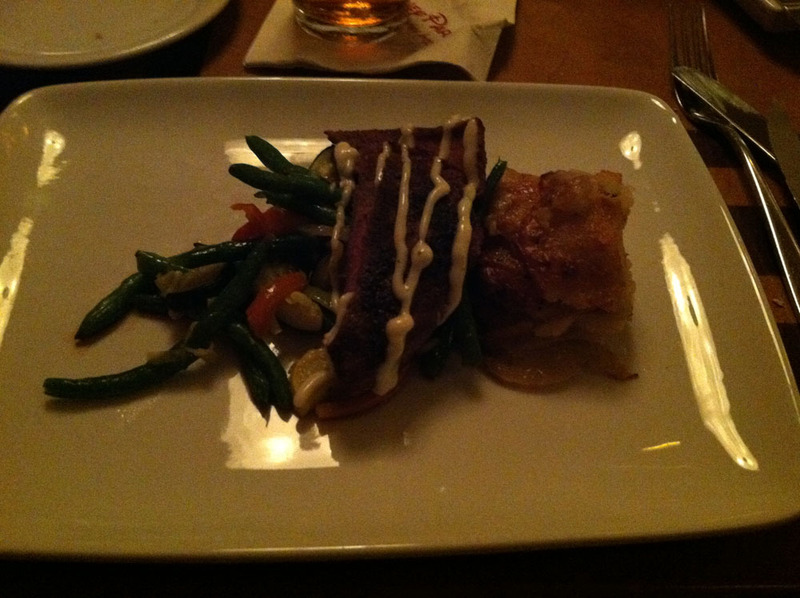 I can’t quite remember what I ordered, but it looks like a steak from this picture (did I mention, it’s nice and dark in the restaurant?). The menu there changes with the seasons, so it’s probably different by now. If you’re looking for a nice sit down dinner that’s outside the parks, but still on the Monorail system, this is one of the best. 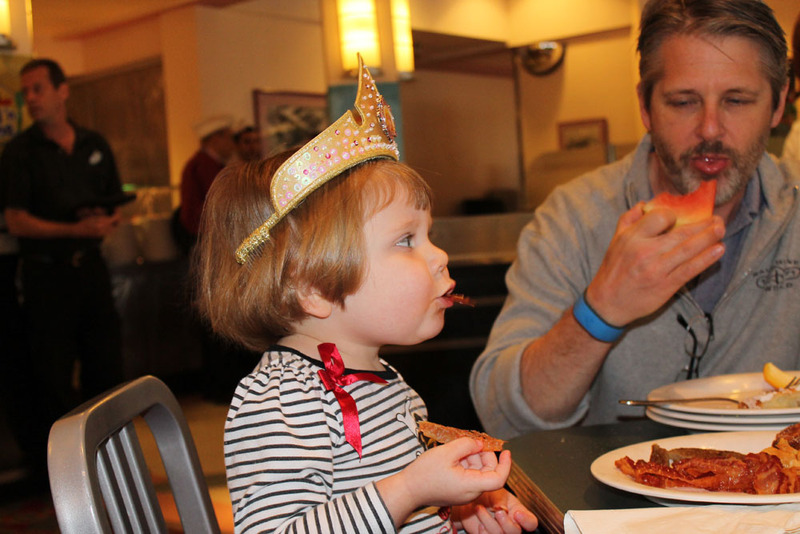 The 6th was my 31st birthday, so we celebrated by going to Hollywood Studios and doing the Disney Junior breakfast buffet at Hollywood & Vine. Breakfast is one of the hardest meals to keep consistent and tasty in the buffet style, but this one was pretty darn great. It had all the basics which were all super tasty. Even the eggs were good and that almost never happens. However, the real delight here was seeing my kid’s eyes light up as she got to meet Sofia the First, Doc McStuffins and Jake. She had no idea who Handy Manny was and kind of looked at him like you might someone dressed the exact same way on the subway. For dinner we went to the Spirit of Aloha Dinner Show at the Polynesian. I’ve wanted to do ever since I first heard about it a few years back. Even though the weather got a little dicey, the show was still pretty great, filled with a variety of different dances from all over the world. 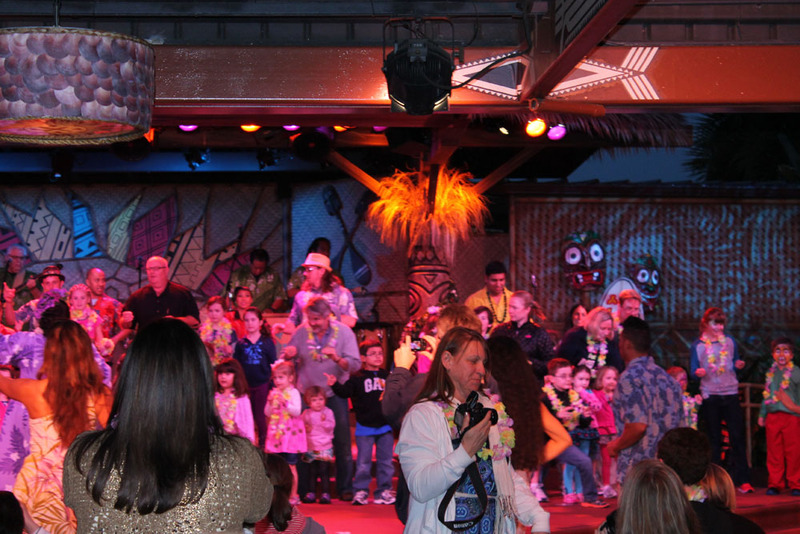 My daughter and dad even got in on the dancing action. See if you can find them in the picture above. The food itself was served in an all you can eat, family style manner with platters. I remember the bone-in chicken being particularly good as were ribs. As a birthday bonus, I had a large drunk in a coconut shaped to look like a monkey which I was able to bring home with me. On our last full day, the 7th, we went back to Magic Kingdom. We’re big fans of starting and ending these kinds of trips there. The weather was a little difficult as it was misting rain and chillier than the other days, but we still had some great food. 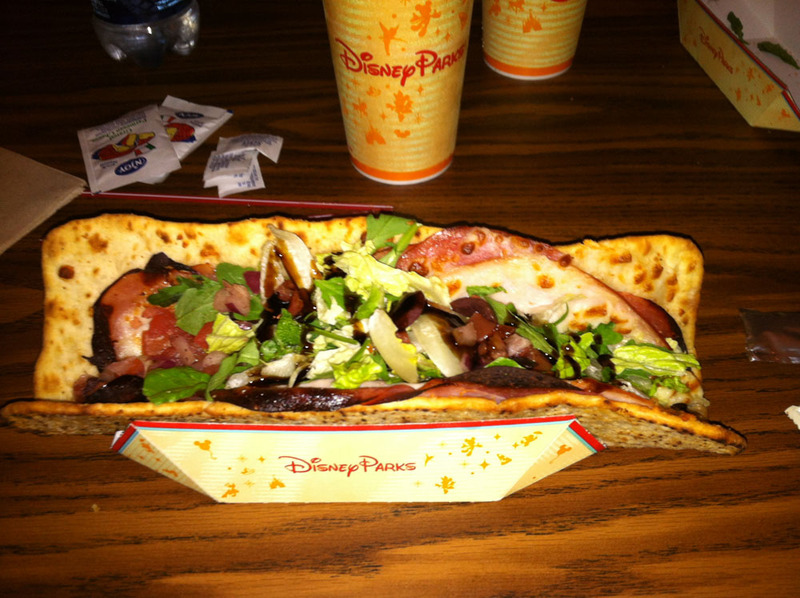 For lunch we stopped in at Pinocchio Village Haus which actually had my favorite single piece of food of the whole trip, the Italian Flatbread Sub which includes Italian Meats, Cheese, Dressing, and Balsamic Glaze on a warm Toasted Flatbread. There was just something so balanced, with the smooth tanginess of the balsamic glaze and salty meats with the melty cheese that hit a lot of my moutbuttons. I also think this might have been my first flatbread sandwich. I’ve got to get more of those in my life. 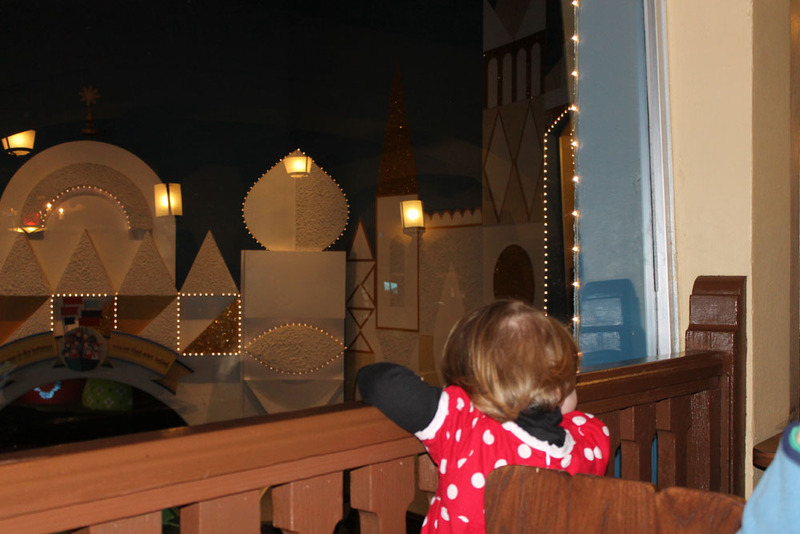 As an added bonus, you can eat over by a window that looks down on the It’s A Small World ride. For our last dinner we went to Be Our Guest which was…interesting. We had to wait out in the rain for our table along with everyone else which wasn’t the most fun thing in the world. And then, partway through, Lu got scared about the idea of seeing The Beast there. Now she’s seen Beauty and the Beast plenty of times and doesn’t get scared, but she got very adamant about not seeing him. It wound up not really mattering because she fell asleep on me before he even showed up. I can’t say for sure because I ate around a toddler the whole time, but I think I had the Braised Pork (Coq au Vin Style), described as Eight Hour Slow-cooked Pork with Mushrooms, Onions, Carrots and Bacon served with Puréed Cauliflower and Seasonal Vegetables. I know we also had a lunch poolside at our hotel The Grand Floridian and my wife grabbed a cronut in Epcot, but I think that about covers our food adventures earlier this year in Disney World.